Red Sarah Bernhardt is a name which has been given by a marketer. It’s not a mutant of the world famous Sarah Bernhardt but as well known as Fiona. 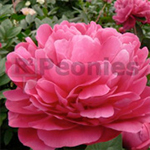 It’s a beautiful double red flower, very suitable for cutting. The firm and strong stems are perfect for cutting. The flowers will open completely and cut flower consumers can enjoy these flowers very much. With flowers up to 15 cm and the dark foliage it’s an eye catcher in your garden. Every year older the plant gives more flowers.